You are excited about your new employee. But it's a lot of work to get him onboarded. ...so why are you requiring him to fill out paper-based new hire forms? 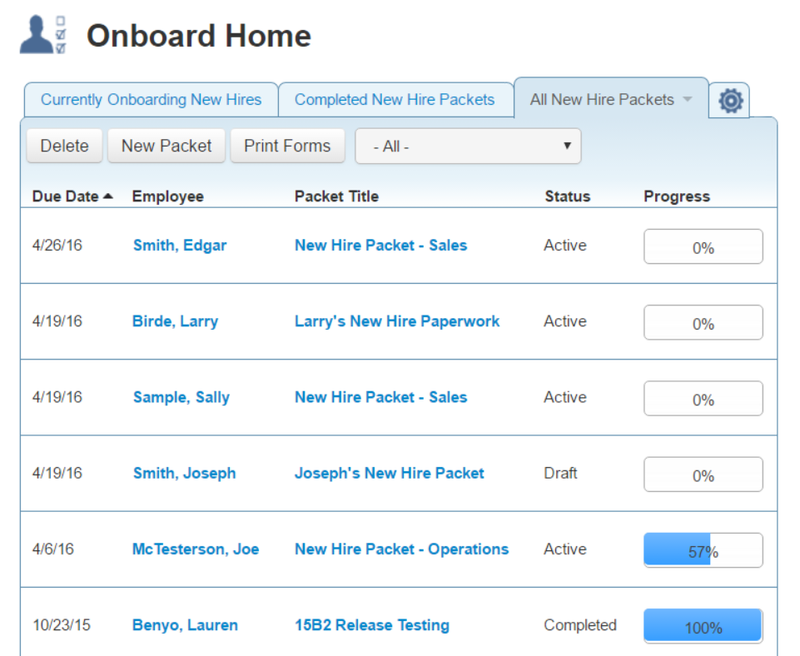 Let TBE Onboard automate new hire packets and other onboarding activities. Cloud based documents and e-signature makes paper-based forms a thing of the past. Let us Show You how TBE Onboarding can help you work smarter!Contact us today to arrange for a free trial or no-obligation demo and information session. Taleo Business Edition Onboard is the modern solution for new employee onboarding and converts your manual, paper-based new hire packets to electronic, cloud-based documents that enable employee self-service and e-signatures. Anywhere, anytime, from any device. Stop doing manual, paper-based new hire forms. Your existing New Hire Packets will get moved to the Cloud. Instead of paper-based packets, convert all of your organization's new hire documents to online forms which employees complete via the web. Include standard forms such as I9, W4 and Direct Deposit Authorizations, but also company-specific documents such as your IT Security Policy or Code of Conduct policy forms. Deliver new hire packets with one click in Taleo: new hires are automatically emailed a link to complete their new hire 'paperwork' online. Automating new hire paperwork with TBE Onboard improves compliance and reduces error rates and legal risk. Taleo automatically sends email reminders to insure forms get completed. No more missing or incomplete forms! 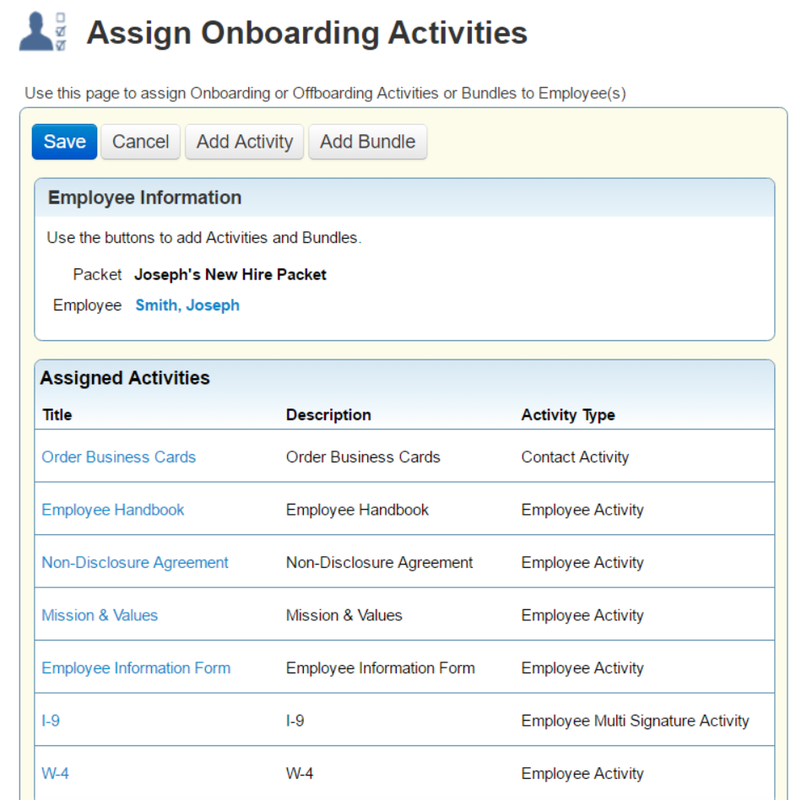 Customize the new hire packets by bundling forms and tailoring them based on your organization's needs. The system automatically determines which tasks and forms are needed for each new hire based on their department and location. Use TBE Onboard for All Employee Lifecycle Events. Add unlimited, customized company forms and documents to manage employee document requirements, such as ongoing IT Security policies or updated employee codes of conduct. Replace all paper-based forms and document storage with electronic versions that are authenticated through e-signature. Stop digging through employee files and instead retrieve all forms for each employee in Taleo with a few simple clicks. Take your existing IT and Facilities service request forms, and convert them to paperless online forms with TBE Onboard: automatically place electronic orders for new hire laptops, phones, access card keys and related new hire tasks. TBE Talent Center allows employee self service to update common employee data such as address, phone, withholdings, and other common tasks. Stop spending time on new hire paperwork; invest in helping new employees understand and succeed in your organization's unique culture. The human capital management best practice is to automate new hire and employee documentation. Employee self service allows your HR team to focus on strategic things and not administration. Instead of spending time on helping new hires complete their new hire paperwork, spend time helping new hires understand and assimilate into the culture of your organization. Saves your HR team hours per week by automating new hire paperwork. Improves candidate / new hire experience by making a positive, modern first impression. So you can stop using all of your paper-based forms. Really. It's time. With online documents signed by e-signature, employees will no longer have to sign and send forms. Use employee self service technology and e-signatures instead of manual, paper based processes. HR staff no longer have to sit with new hires to make sure all the forms are completed and collected. TBE Onboard reduces errors and diminishes legal risk. Automatically confirm that all forms are fully completed on time. Track progress and completion rates of all required documents, all from Taleo. Instantly retrieve signed employee paperwork in Taleo, as opposed to digging through hard copy employee files. The First Question Your New Hire is Going to Be Asked by Family and Friends on Day 1 is "How Was Your Day?" Make sure it's a good one with TBE Onboard. Actual screenshots of TBE Onboard: Simple. Easy. Functional. Assign new hire activities and packets electronically. Correct forms are automatically assigned based on location, department, etc. New hires get their state's tax forms automatically. Automating forms ensures accuracy because fields and signatures can be required. No more missing info. You aren't limited to just new hire paperwork. Automate other employment forms: an updated IT Security Policy, ordering a key car, computer or any other task requiring a signature. All forms are accurately recreated online complete with enforceable legally binding e-signatures. New hires can complete these forms anywhere, anytime, and on any device. All your custom forms will be uploaded and enabled with e-signature technology. No limit to the number of forms, packets or activities you can create. E-signature supports dual signing forms needing both employee and manager signatures are easily handled. Easily track the progress of online forms completion and other onboarding activities for each employee. Automatically assign the right forms and packets based on department, location, job function or other attributes. 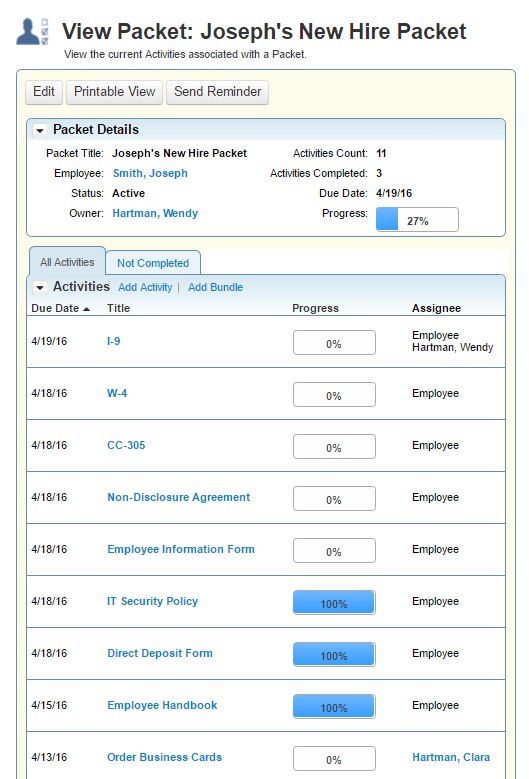 Track the progress of a group of employees against form or packet completion rates to ensure proper compliance. Emails to new hires invite them to complete activities and packets electronically. E-signatures eliminate all paperwork and hand signatures. Activities and forms may be bundled into common tasks to further streamline the process. All e-signed forms stored in the employee record allowing for easy retrieval. Self-service of required employment forms saves your HR team time while also improving the onboarding experience for your new hires. 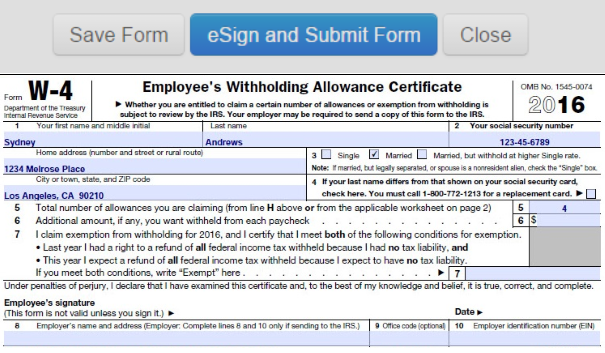 Online forms and e-signatures allow new hires to complete paperwork before their start date. Maintain compliance: No more incomplete or missing forms, data or signatures. No more hard copy files E-signed documents are stored in the Taleo employee record. Assign due dates for individual forms or packets and reminder emails are automatically sent to each employee. Ensure compliance by making sure all employees complete and e-sign required forms, company policies and other "paperwork". Easily send updated forms to groups of employees for e-signature - no more chasing after employees to remain in compliance after policy changes. How Do I Get Started With Taleo Onboard? Automating your new hire onboarding could not be easier. How about a FREE TRIAL of TBE Onboard? Or a personalized Demo? Contact us and we will arrange for a no-obligation demo and/or a FREE TRIAL of TBE Onboard. Already Own TBE Onboard? We'll get it set up in just a few days. As the world leaders in Taleo Business Edition, RecruitingDash has a team of Onboarding experts ready to setup and configure your TBE Onboarding system in a best practice way. We knew nothing about the system starting out and now feel that we are pretty functional only a few months in. The biggest education piece for us has been learning how to edit the system on our own. They have provided great support from the beginning of the implementation process through going live and beyond. All the questions or concerns we have had over the last few months have been dealt with and answered. Sometimes we have do to be walked through the process which is always done in a way we can understand. Director of Recruiting - David Evans and Associates, Inc. Implementing these recommendations has put us ahead of the recruiting curve in our industry and created a better candidate experience all around. RecruitingDash has helped immensely in automating our Taleo workflow. The team at RecruitingDash has a knack for thinking outside of the box and proposing innovative solutions to optimizing Taleo’s functionality. Yes, RecruitingDash takes a hands-on approach with educating their clients on the ins and outs of Taleo. Yes, RecruitingDash has really taken the time to listen and understand our issues in order to provide the best possible solutions. RecruitingDash are truly “experts” when it comes to Taleo. Working with RecruitingDash to implement their reporting tool and to fine tune our Taleo work flow has saved so much time and created ongoing efficiencies that allows us to spend more time with our hiring managers and candidates! What Does it Typically Cost to Setup TBE Onboard? 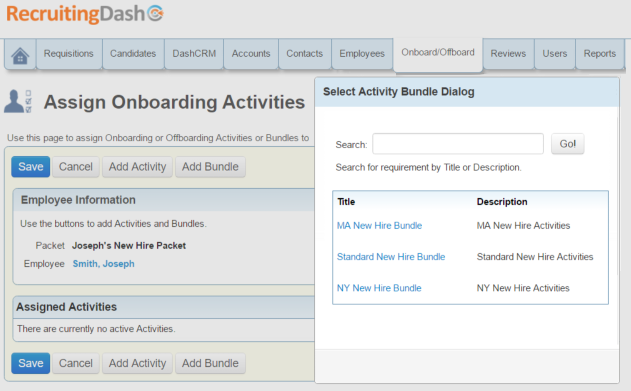 For a limited time, RecruitingDash is offering complete implementation of Onboard for most organizations for only $3500. Contact us for details. How Long Does it Take to Configure Taleo Onboarding? 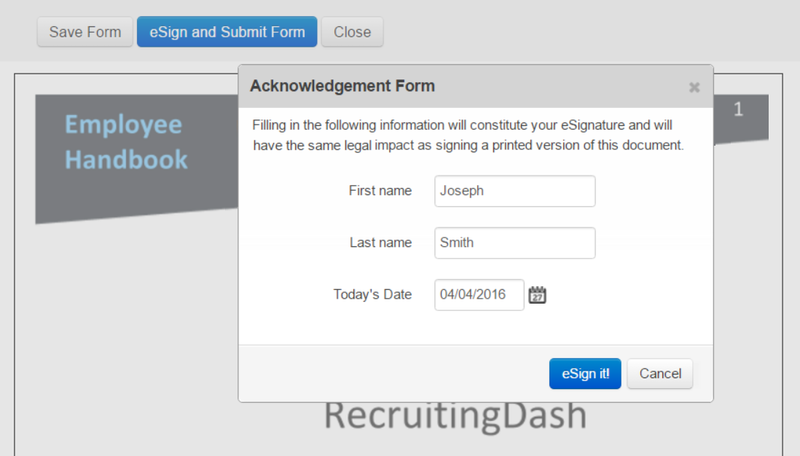 RecruitingDash will have your system setup in about 21 days. Relax. We know you are busy. We'll ask you to gather up all your new hire forms so we may review. Then, after a simple 30-minute kickoff meeting, RecruitingDash does all the work, and you simply sign off on the completed system. What if I already have TBE Onboard and want to turn on Talent Center? Contact us for a no obligation consultation using the form at left and we will talk through your needs and what it will take to setup TBE Talent Center.